Matt Harvey of the Mets is among the major league players who are very happy it's a new year. Harvey was hardly the only pitcher who missed all or most of 2014 due to Tommy John surgery, but he is in great position to return to his former glory in 2015. Despite not pitching in a competitive game at any level last year, Harvey has a lot of things going for him this year. Most significantly, his surgery was performed way back in October 2013, so he will be almost 16 months removed from the procedure by the time pitchers and catchers report to spring training in mid-February. A month after that, he’ll turn 26, meaning he’s out of the commonly recognized injury nexus for pitchers (by way of contrast, Stephen Strasburg was 23 in his first full season after Tommy John and Jose Fernandez, who had the surgery last May, won’t turn 23 until July 31). Harvey is unlikely to immediately recapture his form of 2013, when he finished fourth in the Cy Young voting, started the All-Star Game and led the majors in Fielding Independent Pitching, and the Mets may yet decide to limit his innings. Nevertheless, his return could help New York matter in the National League East for the first time this decade. The slick-fielding Iglesias finished second in the American League Rookie of the Year voting in 2013 after splitting the year between Boston and Detroit, and he was supposed to spend '14 as the starting shortstop for a Tigers team that had won its division in each of the previous three seasons. Instead, he suffered stress fractures in both of his shins and didn’t play a single game for Detroit. The Tigers won the AL Central for a fourth straight time without him, but they never did find a sufficient replacement at shortstop, and they have since discarded three of the four men to play the position for them most often in 2014 (Alex Gonzalez, Eugenio Suarez and Danny Worth). The job still belongs to Iglesias, and all he has to do to keep it is out-hit the lone remaining incumbent at short, Andrew Romine, who batted just .227/.279/.275 a year ago. Joey Votto posted a career-low .799 OPS in an injury-filled 2014. The Rangers as an organization are surely happy to finally be done with 2014, but not every Texas player who suffered a major injury in 2014 will find that easy to do. Matt Harrison’s career is still in doubt following spinal fusion surgery in his lower back, fellow pitcher Martin Perez will spend at least the first half of the year rehabbing from his own May 2014 Tommy John Surgery, and there’s no guarantee that first baseman Prince Fielder will be able to return to his established level of production in his age-31 season after having two vertebrae in his neck fused together. There should be no such concerns about Profar however. He didn’t play a game at any level in 2014, but the injury that kept him out -- the partial tear of the teres major muscle behind his throwing shoulder -- was a relatively minor one. A less severe version of that injury was what caused Clayton Kershaw to miss April of last season, and he returned from that injury to again be the best pitcher in baseball. Profar, meanwhile, will have had 11 months to heal between initially suffering the injury in spring training last year and reporting to camp this year, and he is still just 22 years old. Missing all of 2014 won't have helped his development, and it has effectively given him two consecutive lost campaigns — his 2013 was buried under a slew of call-ups, demotions, and position changes — but he remains one of the top young talents in the game and should be the Rangers starting second baseman, finally, in 2015. Speaking of heralded 22-year-olds, Sano entered 2014 ranked as the No. 6 prospect in the game according to Baseball America and No. 4 by Baseball Prospectus. Alas, his 2014 season was over before it started due to Tommy John surgery. In 2013, he hit .280/.383/.610 across two levels, including 19 home runs in 67 games at Double A. If he can pick up where he left off, he could make his major league debut at some point this season and provide a much-needed boost to a Twins team that has lost 393 games the past four seasons combined, second-most in the majors behind only the Astros. Unlike the other four men on this list, Joey Votto actually got to play baseball in 2014, but his lengthy absences due to a pair of quadriceps injuries were especially noteworthy because of his established track record and impact on his team. 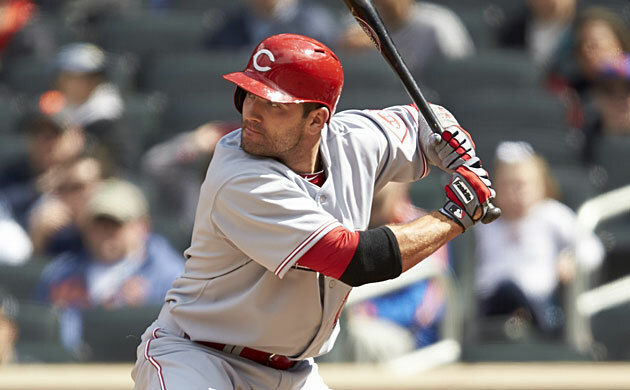 An All-Star and the National League leader in on-base percentage in each of the four previous seasons as well as the 2010 NL MVP, Votto is one of the game’s superstars, but he was a non-factor in 2014, playing in just 62 games -- the last coming on July 5 -- and hitting only six home runs while failing to pick up an MVP vote for the first time since 2008. Accordingly, the Reds, who made the playoffs in three of Votto’s four All-Star seasons, sank from 90 wins and a wild-card berth in 2013 to 76 wins and a distant fourth-place finish in 2014. Heading into his age-31 season, the nature of Votto's injury makes him a good bet to return to form, and with newly acquired outfielder Marlon Byrd on board as additional lineup protection and rightfielder Jay Bruce also hoping for a healthier, more productive 2015, the Reds may just do so as well.